WASHINGTON (CNS) — On Jan. 22, the New York Statehouse burst into cheers after a landmark abortion bill had been passed. The Reproductive Health Act, or RHA, most notably removed abortion from New York’s criminal code and now permits abortions with very few restrictions at any week of a pregnancy. New York Gov. Andrew Cuomo had been one of the bill’s strongest supporters. He called its passage “a giant step forward in the hard-fought battle to ensure a woman’s right to make her own decisions about her own personal health” and additionally ordered that the needle atop the One World Trade Center — the tallest building in the United States — be lit pink in celebration. 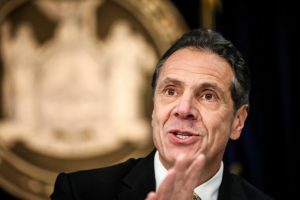 Cuomo, a Catholic, drew the ire of his fellow Catholics in New York and across the country for his advocacy against church teaching on the issue. Some petitioned Cardinal Timothy M. Dolan of New York to excommunicate Cuomo, but they were disappointed when a spokesperson for the cardinal’s office released a statement on Twitter, which suggested that “under canon law, excommunication is not an appropriate response to a politician who supports or votes for legislation advancing abortion” and that issues regarding abortion should be addressed “personally and directly” with offending politicians. The statement laid out “general principles” and did not address any specific individual. So what does the Code of Canon Law say about excommunication for public servants who do not accept elements of the Catholic Church’s teaching? In a telephone interview with Catholic News Service Jan. 28, Villanova University law professor Patrick Brennan, who holds the university’s John F. Scarpa Chair in Catholic Legal Studies, said that Cardinal Dolan’s spokesperson alluded mostly correctly to canon law, but failed to make the “crisp moral argument” that should have befitted the situation. So would Catholic policymakers who ardently support legal abortion qualify as accomplices? “The purpose of the bishops in administering canon law is not from the standpoint of public relations,” said Brennan, who related that including considerations about the church’s public image “sound(ed) prudential” as opposed to morally correct and dulled the overall credibility of the statement. When Brennan was asked about Catholic prelates, like Archbishop John Francis Rummel of New Orleans, and Cardinal Joseph Ritter of St. Louis, who, in the age of segregation, regularly threatened to excommunicate members of their flock — including politicians — who did not enforce the church’s teaching against segregation, he held up Canon 1399 as an example of a “catch-all” that would endorse that kind of action. Presumably, this law could support Cuomo’s excommunication as well. The provision reads, “… the external violation of a divine or canonical law can be punished by a just penalty only when the special gravity of the violation demands punishment and there is an urgent need to prevent or repair scandals.” Brennan told CNS there was “greater willingness among bishops back then” to exercise this sort of discretion and that most bishops today will use Canon 915 to forbid dissenting Catholic politicians from receiving Communion instead. But some bishops argued that excommunication would be the right move at this time. Governor Cuomo and all people should be taught at a young age the truth about abortion. Babies in the womb are souls not just cells and blobs of tissue. It’s murder to kill a baby in the womb, just like it is when baby is outside of the womb. Once they become educated in the reality hopefully they will change their minds about legalizing abortions and having abortions; people can always put baby up for adoption or practice abstinence. Despite our opinions at the end of our lives we have to answer to our Maker not other human beings. Only God gives life, only God takes it away.